Recently, I spent a week in Alaska working on a friends cabin and exploring a very small part of the vast state. Through seeing parts of this enormous land and meeting many of the truly hospitable locals, I came to one single conclusion – everything in the state of Alaska is about extremes. The wildlife, climate and landscape are all multiplied by at least a factor of 3, people whose paths I crossed were inspiring to say the least. I recall seeing a woman while driving through, mowing a 3 acre field, with a push mower, with an infant on her back! Definitely more extreme. 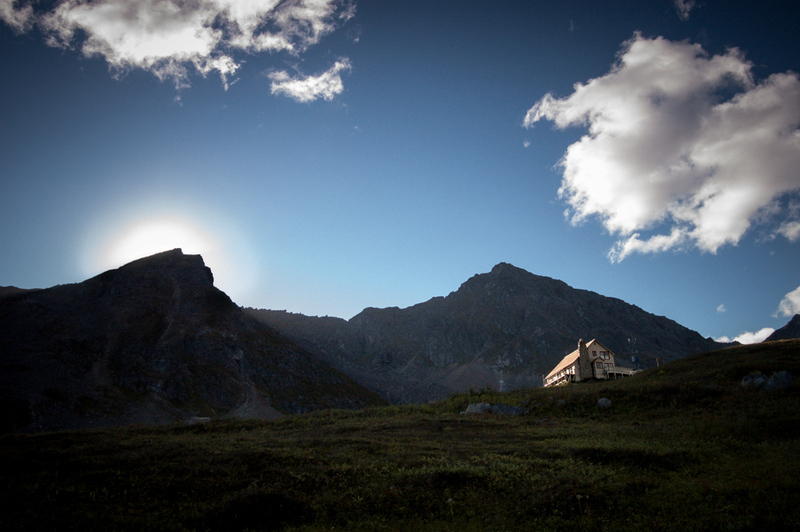 No exception to the extremity rule is Independence Mine, located high up in the Hatcher Pass district of the Talkeetna Mountains. This mine was the remote, year round home to 204 miners and 22 families, including 8 children. The mine ran from 1938 to 1943 when gold was deemed a lower priority to the war effort, mining resumed in 1946 but was finally ended in 1951. In those short years of the mines life, it’s miners blasted and dug nearly 12 miles of tunnel. Very extreme. More mine and travel information can be found on the Alaska State website. In the face of giants indeed. A wonderful show of how, in photography, one can explore the possibilities that light offers. The building stands out in the face of those big mountains.